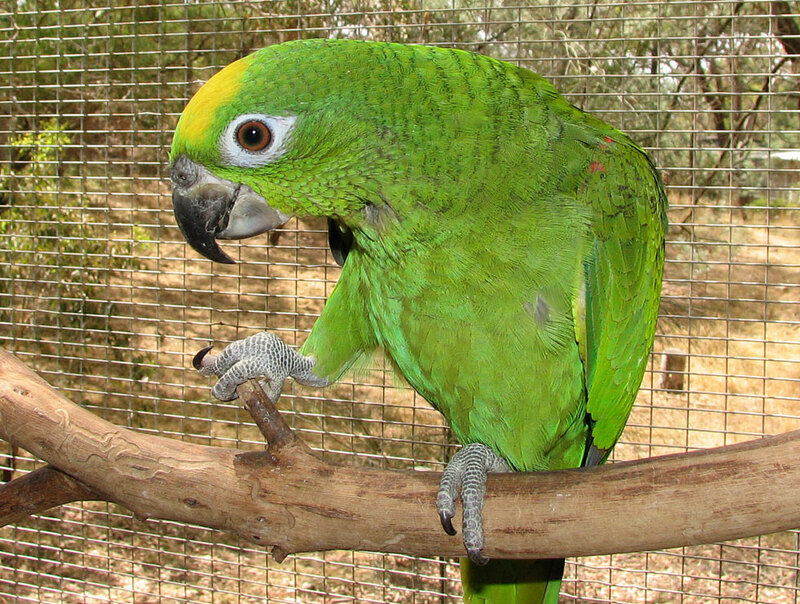 Psittacus ochrocephalus Gmelin, 1788, Venezuela. Ten subspecies. 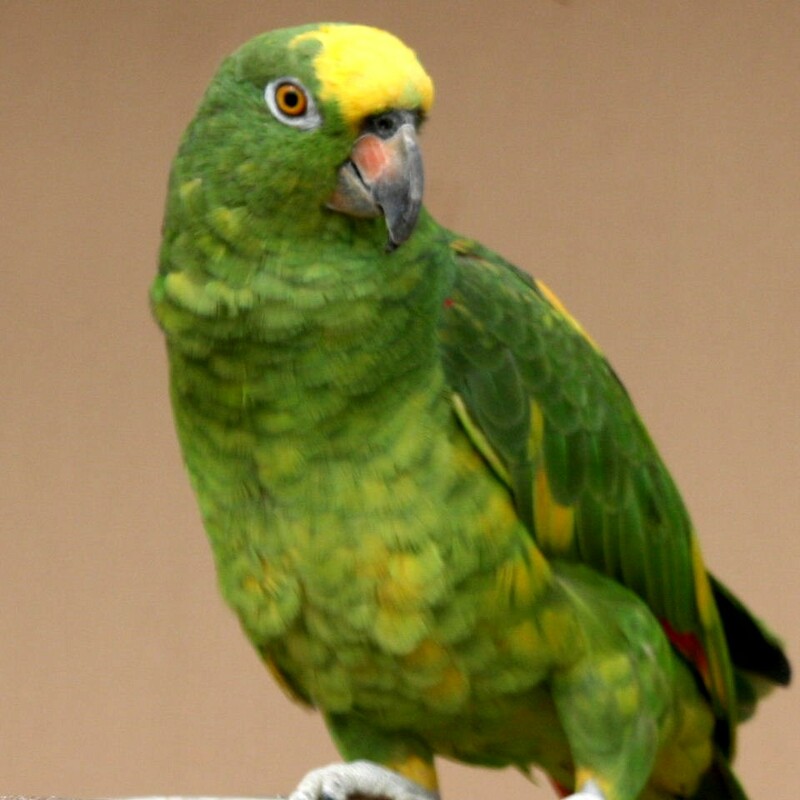 English: Yellow-crowned parrot, yellow-headed Amazon, yellow- naped Amazon; French: Amazone а front jaune; German: Gelbscheitelamazone; Spanish: Amazona Real. 13.8 in (35 cm); 08–1.1 lb (405–561 g). Stocky, short-tailed species with strong geographical variation; northern birds have entirely yellow head; southern birds have yellow forehead and nape. Juveniles entirely green. A. o. ochrocephala: east Colombia through Venezuela to Guianas, Trinidad, and Parб, north-central Brazil. A. o. xantho- laema: Marajу Island, Amazon River, north Brazil. A. o. nattereri: south Colombia, east Ecuador and east Peru to north Bolivia and west Brazil. A. o. panamanensis: northwest Colombia to west Panama. A. o. auropalliata: northwest Costa Rica to south Mexico. 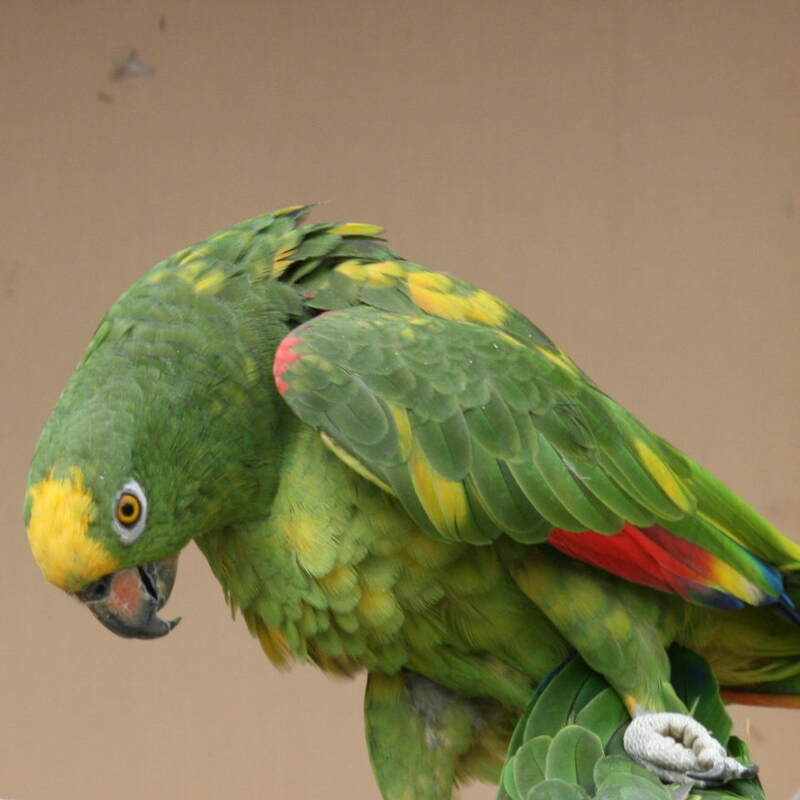 A. o. parvipes: northeast Honduras and north Nicaragua. A. o. caribaea: Bay Islands, Honduras. A. o. belizensis: Belize. 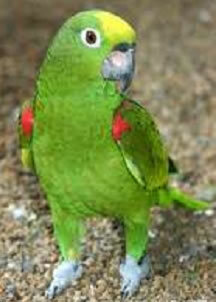 A. o. oratrix: Pacific and Caribbean lowlands of Mexico; introduced to Florida and California. A. o. tresmariae: Tres Marнas Islands, west Mexico. Lowlands; variety of wooded habitats, including tropical forest and deciduous woodland, gallery forest in open country, tall scrubland, riverine secondary growth, mangroves, Pinus woodland, stands of Mauritia palms, remnant woodlots in cultivation, and suburban parks or gardens; in Amazon River basin prefers seasonally inundated forest. Sedentary, though some local movements with changing food supplies. Large flocks may congregate at nighttime roosts, but during the day small parties of up to 10 usually seen feeding in treetops; quiet while feeding but when disturbed, do not call until well away from tree; strong flier, flying quite high on long-distance flights to and from nighttime roosts; paired birds remain close together and readily discernible within flocks; associates with other parrots at clay-licks on exposed banks. Feeds arboreally, taking seeds, nuts, fruits, berries, blossoms, and probably leaf buds; uses foot to hold fruit while extracting seeds with bill; fond of maize and cultivated fruits. Monogamous. Breeding recorded mainly December–May. Nest in tree hollow, often in dead branch or decayed palm stump, also in hole excavated in arboreal termitarium; hollow prepared mostly by female for up to one month before egg-laying; clutch of two to four eggs incubated for 25–26 days by female, male remaining near nest entrance; sitting female fed by male; in captivity, young birds left nest two months after hatching. Generally common, though locally scarce; yellow-headed subspecies (A. o. oratrix and A. o. belizensis) threatened by capture for live-bird trade and by deforestation; in 1990s population of endangered oratrix estimated at below 7,000. Listed on CITES Appendix II. 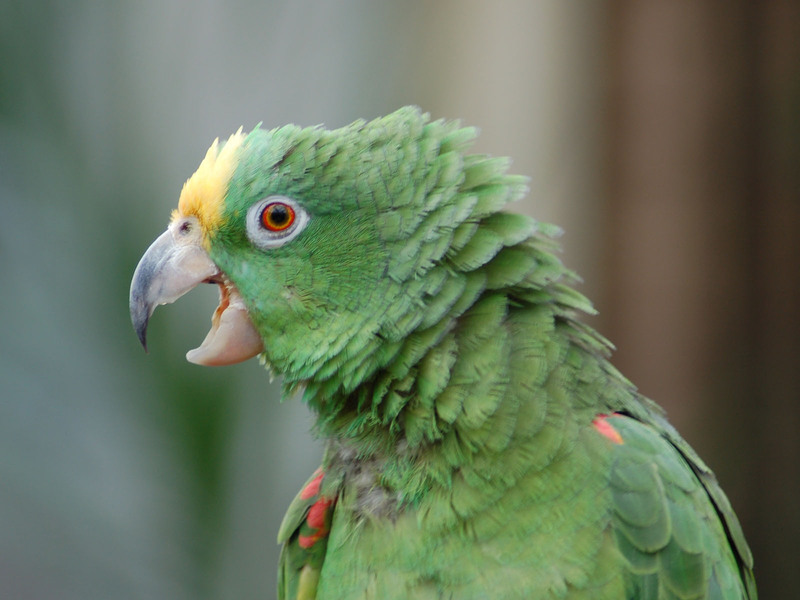 Reputation as excellent “talker,” so popular as pet in all parts of range; yellow-headed subspecies also in strong demand for international trade. Reported to cause damage to maize crops and in orchards.